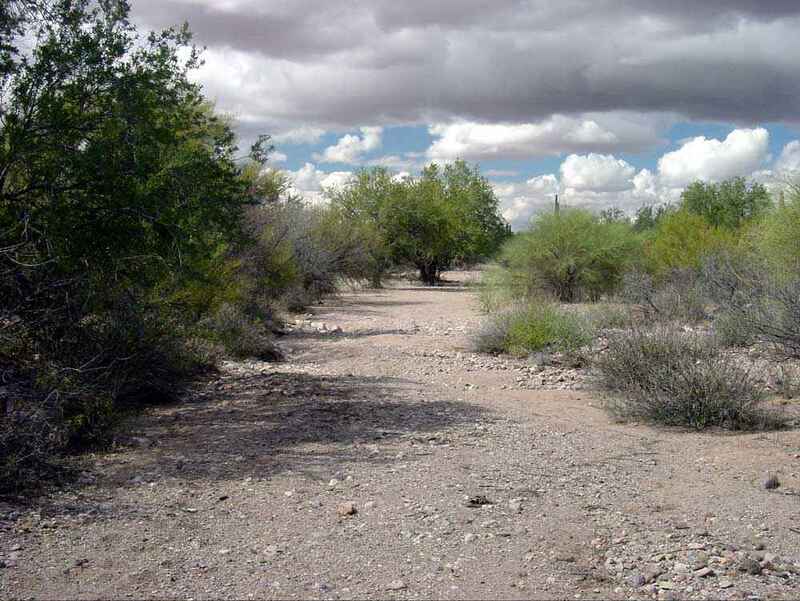 Above: Desert washes are also called xeroriparian habitats to indicate their relationship with rivers. Like typical rivers, washes are linear, chronically disturbed habitats that concentrate water and nutrients from a large area, and serve as dispersal corridors for plants and animals. The main difference is that washes have surface water for only brief periods, often just for a few hours in a year. 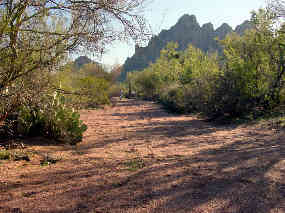 Valleys on the west side of IFNM are transitional between Arizona Upland and the drier Lower Colorado River Valley Sonoran Desert (LCV). 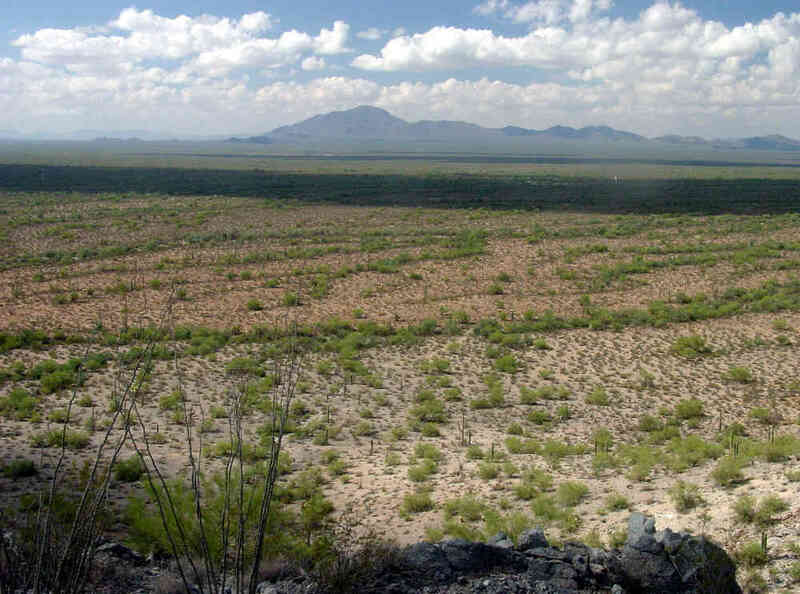 Vegetation is more concentrated in washes in drier habitats, making washes highly visible from above. 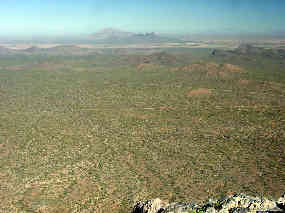 This view is from the southern West Silver Bell Mountains. In really dry LCV, trees occur only in larger washes, and even smaller plants are concentrated along the smaller drainages. 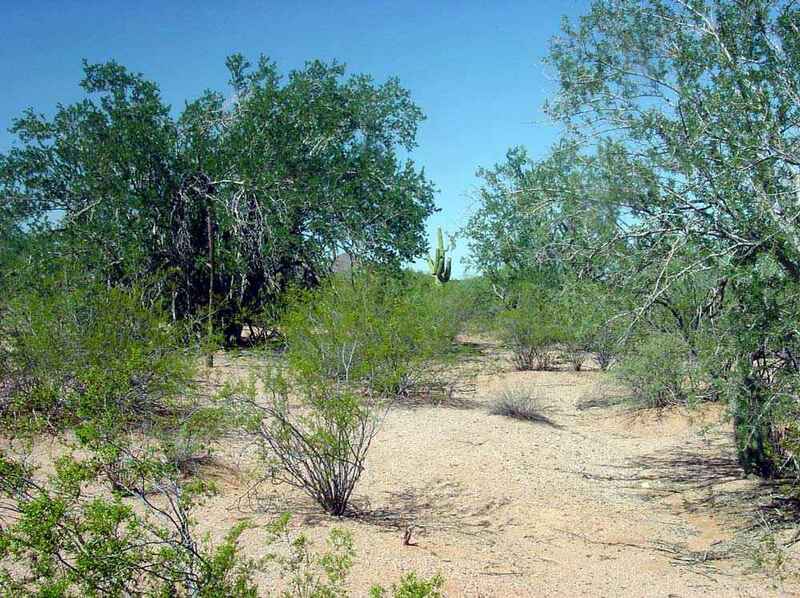 This blue palo verde- and ironwood-lined wash is south of Blythe, California where average annual rainfall is less than 5 inches (125 mm). View north from Ragged Top across the Samaniego Hills to the sharp Picacho Peak (State Park). 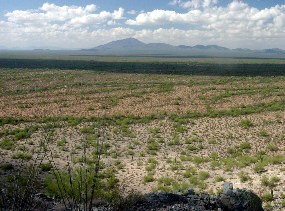 Southern Waterman Mountains with Roskruge Mountains in background. Above: In Arizona Upland trees are not restricted to washes. Washes are less conspicuous from a distance than they are in LCV, even though the trees are larger and denser because of the extra water available to them. A small wash on the bajada of Ragged Top supporting many ironwood trees. Pescadero Wash in the Roskruge Mountains is large and rich in ironwood trees. Washes do not always have distinct channels. 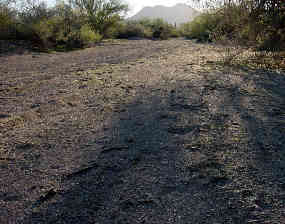 This is a broad sheet-flood area in the Avra Valley east of the Samaniego Hills. 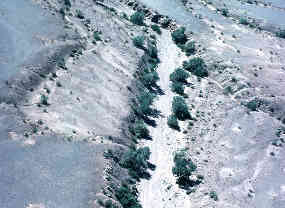 Only in an aerial view do the trees indicate where most of the water flows during heavy rains. 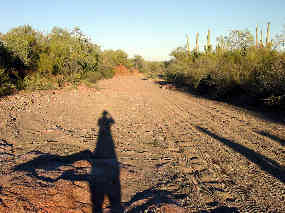 Aguirre Wash in Aguirre Valley is a mile wide. This is one of its many braided channels. 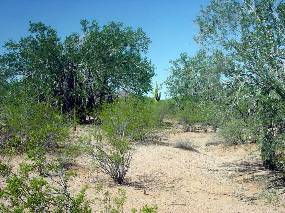 Almost all the trees are velvet mesquites; they form an extensive bosque or mesquital. 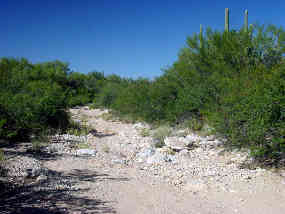 Washes on steeper slopes may have rocky bottoms because the sand and gravel are washed downhill. 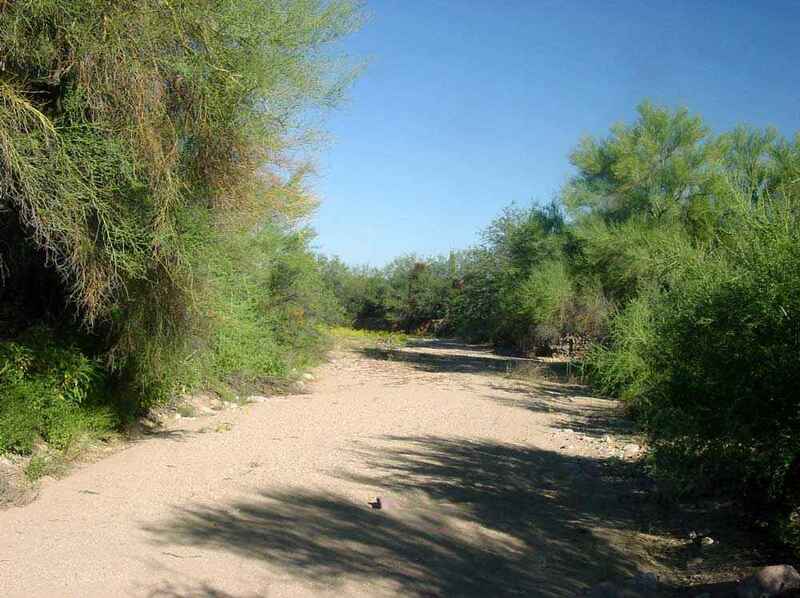 This one is in the Waterman Mountains. 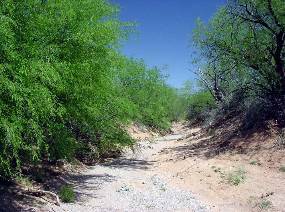 Where the soil is too thin to support trees, washes may be lined with shrubs. 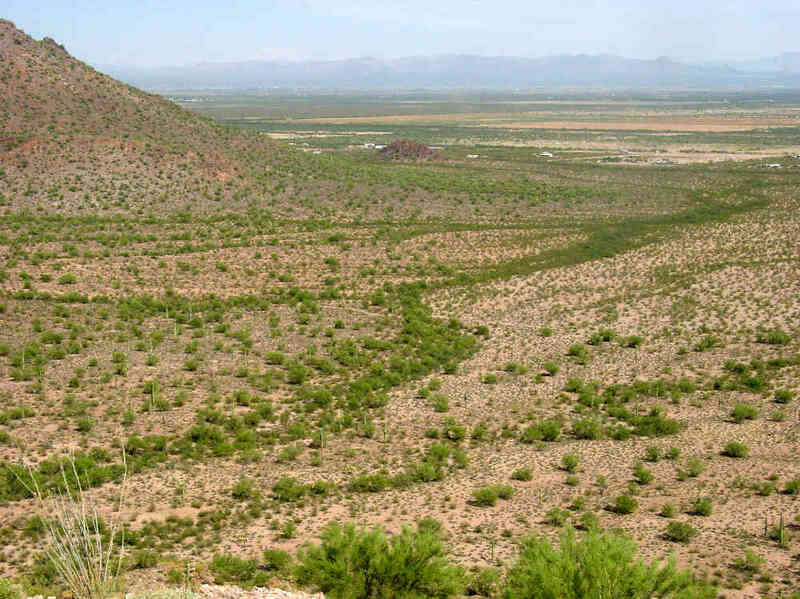 This one in the Roskruge Mountains is lined with two species of acacia (A. constricta and A. greggii). 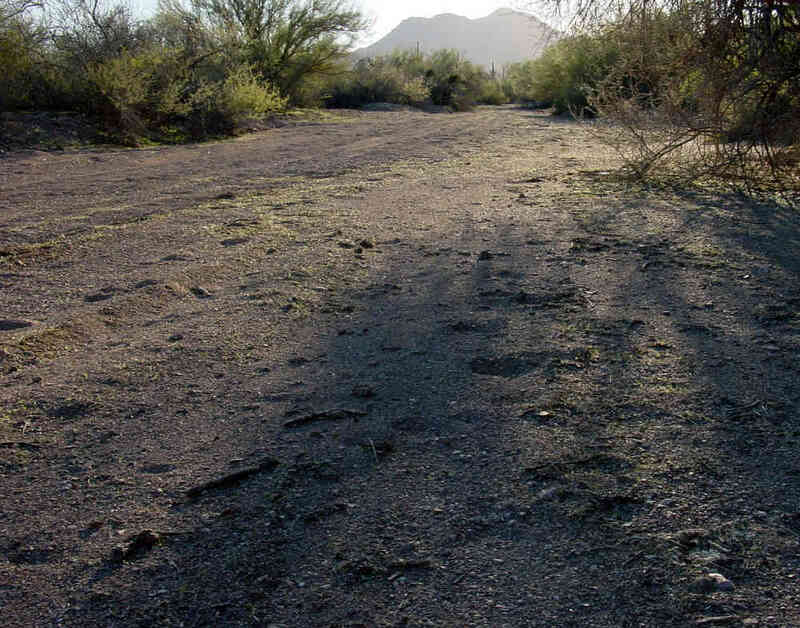 Above: Most larger washes in IFNM are disturbed by vehicle traffic, even though many are posted and barricaded. The one on the left, in the Roskruge Mountains, has had limited traffic and has a good herbaceous vegetation cover in the channel in the background. The one on the right, near Ragged Top, has suffered heavy traffic and its channel is denuded. 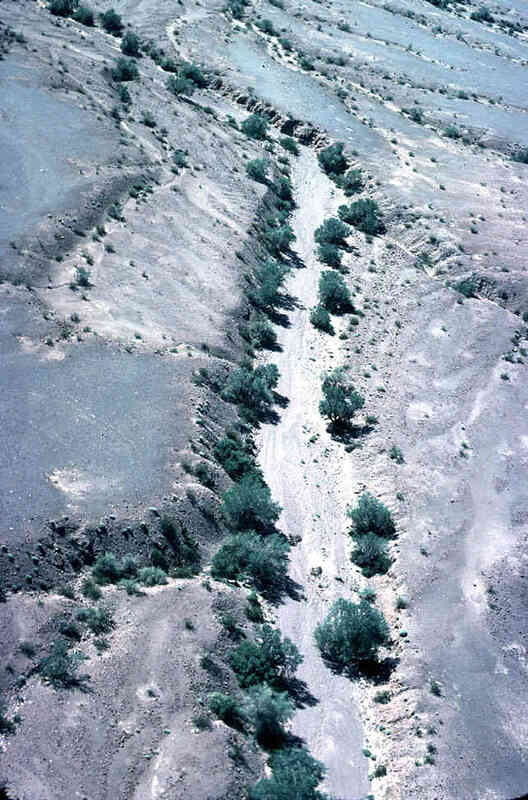 Major flash floods also scour out plants in wash channels, but these events occur only once every few years. 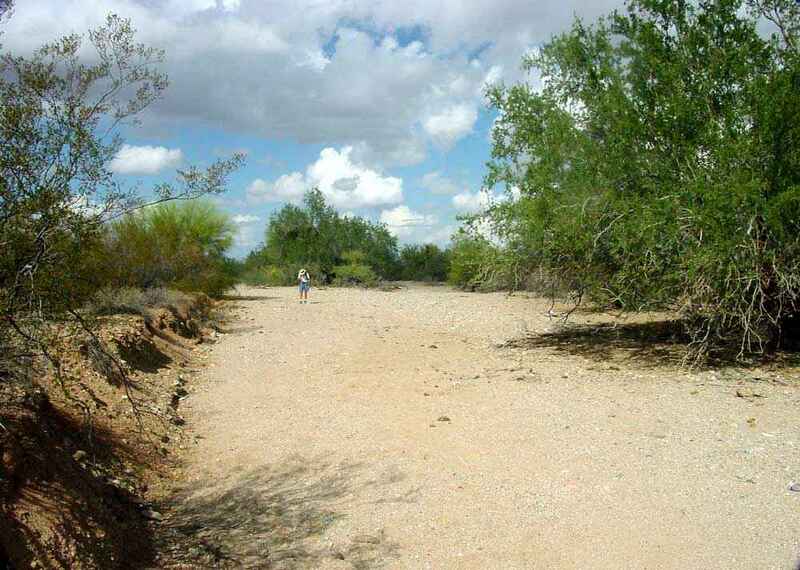 This wash near Ragged Top has a greenish cast from a mass germination of annual plants following a soaking (but not flooding) rain. Vehicle traffic subsequently killed most of them. 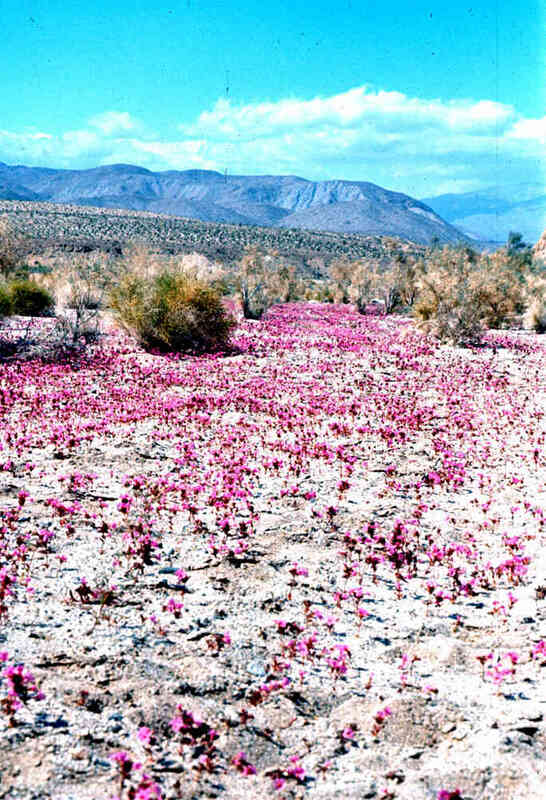 Wash channels that are protected from traffic can support excellent displays of wildflowers in wet years. 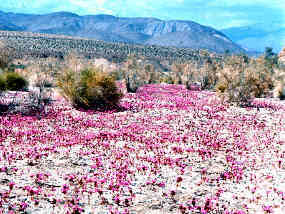 This one is in Anza-Borrego Desert State Park east of San Diego, California.